A recent audit of the Housing Authority of Portland's largest housing project to date – New Columbia in North Portland – shows that this public agency is walking its talk on minority hiring practices. Last November, HAP authorities said they wanted to use at least 20 percent minority- and women-owned contractors on its housing projects. Six months later, a city audit shows that the agency has far exceeded this goal. According to a recently released city of Portland audit, nearly 45 percent of the total construction hours billed to HAP's New Columbia housing project came from women- and minority-owned contractors. The audit also noted that 25 percent of subcontractors hired for projects that exceeded $100,000 were disadvantaged, minority- and women-owned businesses. "We knew this would be a very big housing project," said Housing Authority Director Steve Rudman. "It also had to be a big economic boon (for the community)." In recognition of HAP's efforts, the Oregon Association of Minority Entrepreneurs will award the agency its Public Agency of the Year Award on May 10, at OAME's 19th annual Conference and Trade Show at the Oregon Convention Center. Jerry Walker, HAP's purchasing manager, says it's no fluke the agency reached and exceeded its minority- and women-owned contractors goal. Walker said HAP encouraged Walsh Construction, the agency's construction manager/general contractor, to reach those goals. Special attention was also given to the way subcontractors were recruited for jobs. Bidding opportunities were divided into smaller projects to make it easier for Walsh to identify strengths and weaknesses among companies. And, to level the playing field, disadvantaged, minority- and women-owned businesses were given an opportunity to bid against similar companies for certain projects. The Housing Authority also coordinated with the apprenticeship coordinator at the Columbia School of Construction to attract minority and women apprentices. About 18 percent of the workers at New Columbia were apprentices, and 50 percent of those apprentices were women and/or minorities. "Hopefully what it ultimately means … is more minority and women working in the construction trades," Walker said. But will HAP be able to duplicate these high rates of minority- and women-owned contractors in the future? Faye Burch, of F.M. 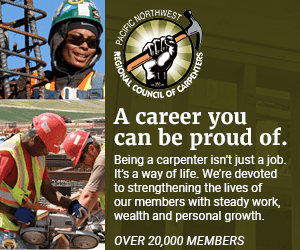 Burch & Associates, a member of the National Association of Minority Contractors of Oregon, said she is pleased with the numbers. "I think the Housing Authority did an exceptional job of recruitment," she said. "They raised the bar." Maintaining those recruitment goals may be challenging, but the agency hopes to exceed its 20-percent goal with another new project at Humboldt Gardens. Carolyn Wilson, community outreach administrator for Walsh Construction, said the model for recruiting and nurturing disadvantaged, minority- and women-owned businesses can easily be replicated, but it will take a commitment from the top down. Walsh has been recruiting minority subcontractors for years, so when it came time to find subcontractors for New Columbia, she said they used many businesses Walsh Construction had worked with in the past. Wilson and her team helped many business owners with paperwork, payroll, workforce training and contracts. "We encouraged (subcontractors) to have a specialty," Wilson said. "There has to be something that they can zero in on." Possibly the biggest success story to emerge from New Columbia is the growth of CJ Jackson Construction, which was subcontracted to build several blocks of New Columbia. Wilson said Walsh was so impressed with the work, it lead directly to a unique dual-leadership project. Walsh Construction has teamed up with CJ Jackson Construction to complete work on the Humboldt Gardens (previously Iris Court) housing project on North Vancouver Avenue. It was the Housing Authority's first project with two companies acting as the general contractor, and Rudman believes it is a model that works and can be duplicated in the future. HAP aspires to hire minorities and women for 35 percent of the workforce on the Humboldt Gardens project, with a continued effort to sustain minority and women apprenticeships. "It gets money in the pockets of people from the community and to people who have normally been shut out of this business," Rudman said.